CTET Paper 2 Answer Key 2019 – You can download CTET Paper 2 Answer Key for all four sets here. CBSE CTET exam date is July 07, 2019. With the answer key, the question paper is also published. Candidates can check and download the entire CTET Paper 2 Answer Key for sets and subjects, as PDF, from this page. The calculation of marks or estimation of CTET result should be done as per the marking scheme given by CBSE. Hence, 1 marks are to be allocated for each correct answer and no marks are to be deducted for an incorrect response. Check complete details about the CTET Paper 2 2019 Answer Key from this page. The Central Teacher Eligibility Test paper 2 for classes VI to VIII (elementary stage) are given here. Answer key is released in PDF form. Candidates can download the same from this page. Answer Key of CTET 2019 Paper 2 will be updated here after exam. Names of question paper sets will be revealed on day of exam. Paper 2 of Central Teacher Eligibility is for classes VI-VIII teachers. Answer key of CTET 2019 Paper 2 for each set contains correct answers of all 150 questions. Each correct answer fetches 1 mark. If candidates get 90 marks out of 150 in CTET Paper 2 as per answer key, then they have chances of qualifying exam (chances and not confirmed because answer key is final only when CBSE releases it after result). To be precise, total 150 questions are to be attempted in the CTET Paper 2. From each section, i.e. CDP, Language I, Language II, 30 questions each are asked. In sections Mathematics and Science, Social Studies/Social Science, 60 questions are asked. Candidates can go through CTET Paper 2 Question Paper 2019 while matching the answers to recall the question and the technique they used for solving. This way, candidates will also know how many questions are correct in the paper. Question Paper of CTET 2019 Paper 2 will be updated here after exam. Candidates may please note that CTET answer key Paper 2 published immediately after the exam is unofficial. These answers are solved by coaching centers and individual education experts. You can note them for reference purpose. However, exercise judgment while taking any steps on basis of unofficial CTET Answer Key 2018 Paper 2. How to Download CTET Official Paper 2 Answer Key 2019? To download CTET answer Key 2019 of Paper 1 from ctet.nic.in. go through steps given in video below. Follow steps below to download CTET Paper 2 answer key from this page. Click on small arrow at the corner of the pdf. Use left click on the mouse to download the answer key. Follow steps below to download answer key from ctet.nic.in. Click on answer key, OMR sheet link. Login with roll number and date of birth. Download answer key and OMR sheet. It is important that the candidates should once go through the exam pattern for CTET 2018 for Paper 2. This will help them to calculate the marks using the CTET Paper 2 Answer Key. Check the CTET 2018 Exam Pattern for paper 2 from the table below. How to Calculate Marks Using CTET Paper 2 Question Paper and Answer Key? The candidates must calculate their marks as per the marking scheme which is given by the CBSE. To calculate the probable score, the candidates have to add and deduct marks as given below. There is no negative marking, which means, that you need not to have to deduct any marks in case of the wrong answer. It should be noted that this will just be the predicted score and the actual CTET 2019 Result will only be announced by CBSE. Please note that you need at least 90 marks out of 150 in order to qualify CTET Paper 1 2019. As per the information provided on the Official website, the candidates need to secure at least 60% marks. The cut off marks are minimum marks which one need to obtain in order to be declared as “Qualified”. Those who will obtain marks equal to or greater than the cut off marks will be declared as qualified and will be issued the Eligibility Certificate. Exam held on December 09. Official answer key released on December 28. The official answer key of CTET Paper 2 for all the sets and subjects is given below. Click here to download the CTET Paper 2 Answer Key. 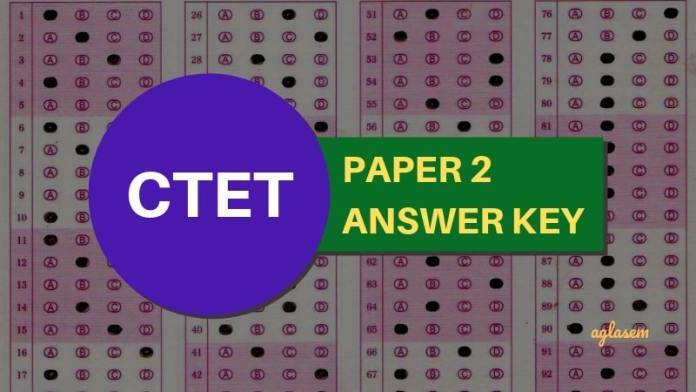 Click here to open CTET Official Answer Key for Paper 2 in new tab. Set M Click here for CTET Paper 2 Answer key – Key published for all subjects! Set N Click here for CTET Paper 2 Answer key – Key published for all subjects! Set O Click here for CTET Paper 2 Answer key – Key published for all subjects! Set P Click here for CTET Paper 2 Answer key – Key published for all subjects! We went live on the exam day to provide you the answer key. You can watch the video again and do not forget to like and subscribe. If you have any queries regarding CTET 2019 Paper 2 Answer Key for any Set, please ask in comments below. There are links given below the page you can check there. We will try to update soon. Good afternoon sir need set p 2 papaer answer key. Your uploaded document paper key and pdf omr key key not matching sir there are many variations in it. we will update you as soon as answer key will be updated.